“Decompression” has been a hot topic in the American comics community for a number of years now. Characterized by a high panel count with each individual panel being relatively “light” on information, it is noted as being the primary mode of panel progression in manga as well as an increasing presence in American comics. Among superhero fans however, it seems to garner a particularly adamant resistance, one that goes as far as to champion “compressed” storytelling in contrast to it. A cursory investigation on the topic of decompression on comics sites and blogs results in far greater instances of harsh criticism aimed at decompression than ones defending it, with the criticisms usually pointing out a lack of paneling efficiency or an unsatisfactory amount of story development within a given chapter. Because of the thin, monthly format release traditional to superhero comics, decompression is thus characterized as being a waste of not only time and (page) space, but also money. “Why show in five panels what you could easily show in one or two?” is the question lobbed at manga and decompressed comics in general. Amazingly, at a time when new comic titles are lucky to survive beyond 12 issues, we are seeing comics where an entire month is devoted to the protagonist talking to his girlfriend. Most of us have had relationships that didn’t last that long. It is only a matter of time before we will see a superhero title get cancelled before the hero even makes his first appearance in costume. Imagine “Superman” getting the axe just before the rocket lands in Smallville. No wonder it now takes five issues for Spider-Man to beat the Green Goblin nowadays. It’s a city in the future (a bagel breakfast cost 9 dollars, some futuristic cars and ad scrolls, the parking meters, the coffee cup disintegrates before it hits the ground). Umm … yeah, that’s it. Four panels for that???? If you found this comic page floating along our hypothetical street after someone in a fit of pique after spending 3 bucks on this ripped it out and hurled it to its fate, you would know absolutely nothing about this comic book except that it’s set in the future. That’s it. Would that make you want to buy the book? They make a fair point. You don’t want a story with so little content that it becomes completely forgettable. However, from the above statements, you can begin to see how the concept of “content” is defined by the American superhero comics community. Content is a superhero getting their first costume. Content is Kal-El’s ship crashing in Smallville, Kansas. Content is Spider-Man foiling the Green Goblin. In other words, “content” consists of crystallized plot points within a story, things you can point to in a summary however large or small to say, “these are the moments of importance.” What content is not, apparently, is the silent expression of a moment in time or an entire month devoted to a main character and his relationship with his girlfriend. That those elements are considered to be superfluous to what “really matters” is, I think, the root of major misconceptions when it comes to understanding decompression or manga-style paneling. If you were to go up to a manga author and say to them, “Your manga wastes the vast majority of its space,” they would probably look at you incredulously, because efficiency in page layout is actually very important for manga creators. If you then pointed to a Silver Age superhero comic as an example of brilliant economization of panels, they would probably react with still more disbelief, amazed at how much the page seems to be weighed down by its own contents. This is because the concept of “panel efficiency” is defined differently between the American superhero comics tradition and Japanese comics tradition. The difference can be summarized to some extent as the contrast between efficiency defined as the greatest amount of “stuff” packed into the smallest amount of space possible and efficiency defined as a slick, streamlined experience, but that doesn’t quite tell the whole story. 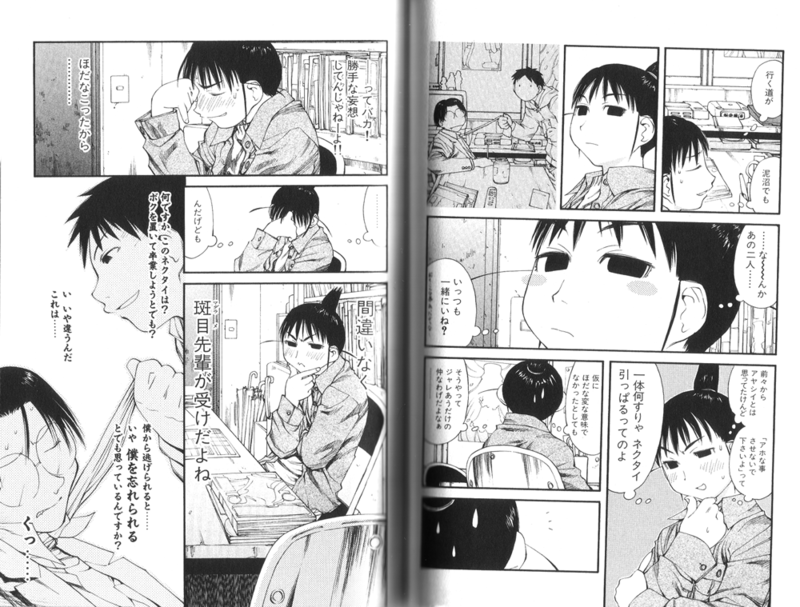 Above is a scene from Genshiken, a comic about a group of nerds who hang out together. It’s one of my favorite moments from my favorite manga about my favorite character, to the extent that I use it for the Ogiue Maniax banner. In it, Ogiue, the girl with the “paintbrush” hair and this blog’s namesake, has just witnessed a frivolous argument between two guys in her club, and is using that as fuel for an elaborate fantasy involving the two guys as romantic partners. Partway through, she tries to curb her imagination, but it’s so futile that she seamlessly transitions back into the fantasy. Looking at those two pages, this moment is expressed in 11 panels. While you could make this scene more “efficient” in the American comics sense and just drop it down to maybe three or so panels—one for her beginning to fantasize, one for her trying to stop, and one for her continuing—it would change the very nature of this scene. It wouldn’t necessarily be a “worse” depiction, but the emphasis would be different. In panel 2, you see a closeup of Ogiue’s face with no text. From it, you can sense that the gears in her head are beginning to turn. Then, in the subsequent panels, the thought comes to life, growing slowly as if it has a pulse and rhythm all its own. The panels show Ogiue from different angles with varying expressions on her face, punctuated every so often by a brief pause, allowing the reader to see into her mind, not just in terms of what she’s thinking, but the process by which her thoughts unfold. So while the broad arc is “fantasize, pause, fantasize,” it is the “decompression” of that moment which gives it strength as a moment of characterization. You may be thinking that the reason I like these pages are because of the fact that Ogiue is in them, but it’s actually quite the opposite. Moments like these are why I grew to like Ogiue in the first place. Decompression in comics is not the same as having “natural-sounding dialogue” or having a moment feel more “realistic.” While those end up having a presence in many decompressed comics, especially in many of the American comics which have been in that vein, they’re not the reason decompression happens. Instead, decompression is about giving moments in a comic room to breathe, to show that those spaces in between the “major points” are important in their own way, or perhaps just as, if not more important. The result is that it affects everything else in the comic, from characterization to page design. That is not to say that decompression can be used as a default excuse to defend the pacing of a comic. A comic which meanders, whether it’s manga or a superhero comic, can be enormously frustrating, but there is a big difference between “being slow” and “being directionless,” and the idea that “nothing is happening” may actually just be based on a pre-existing valuation of certain traditional elements within American comics that was less emphasized in Japanese comics. It is also important that decompression not be considered automatically a better form of comics expression, because the artistic tradition that has grown out of superhero comics is just as valid as any other. The rich “information density” of a “compressed” comic is its own sort of adventure, and you can even find some manga that utilize it to a certain degree, such as the work of Shirow Masamune (Ghost in the Shell, Appleseed). On that note, it would also be a mistake to say that a comic of purely decompressed panels is better than one consisting of entirely compressed panels. This is because not only is it impossible to truly achieve both (even the most “decompressed” panels involve some compression and vice versa), but also because individual execution and personal preference play enormous roles at that point. Perhaps some of the trouble brought on by the presence of decompression has less to do with the properties of the concept and more to do with the growing pains that have come from transitioning and adapting it into the American superhero comics culture. Sometimes I think “decompression” is both the right and wrong word to describe this style of storytelling in comics. On the one hand, it does a good job of bringing to mind the “room to breathe” concept, emphasizing the lingering, undefinable inner emotions of a character or growing tension or the blow-by-blow impact of a fight scene. On the other hand, it also implies that the “significant” portions of the story are being pushed further apart from each other, when what is really happening is that the “small” moments are being regarded as anything but. This entry was posted in art, manga, philosophy and tagged american comics, decompressed storytelling, decompression, superheroes. Bookmark the permalink. Most American comics are released at a rate of 21-24 pages a month while most manga are released at 16-20 page a week. I think that plays a big factor in the American comics community’s negativity towards decompression. A decompressed manga probably still has more “content” in a month than a typical compressed American comic. While the size of manga, especially the weekly stuff, is something of a factor, I do have to point out that monthly manga exist and they don’t simply double or quadruple the amount of pages a weekly has. 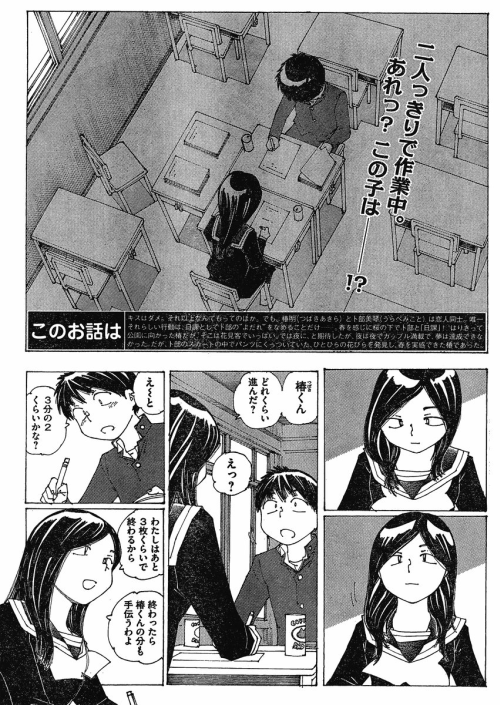 Looking at even a chapter of Genshiken, they are usually somewhere in the mid-high 20s. True. My basic point is that I think a lot of these criticisms are either explicitly tied to price and output speed, or have economic distaste being masked as aesthetic distaste. At the risk of overgeneralizing again and ignoring wages, audience size, the decline of manga magazines, and yada yada, but a weekly manga magazine costs what? 300 yen for 400 pages of multiple stories? And a single American comic book is something like $3 for 20-something pages. These criticisms aren’t coming from readers of American graphic novels too, are they? Well, my friend complained that Chris Ware’s Jimmy Corrigan book was slow and boring, but I think he was talking about the story in general and not the decompressed nature of it. Maybe another factor is the lack of experience in decompressed style in the superhero artist community. Their early experiments with it come off as stilted and plodding compared to Japanese artists who had Tezuka’s “cinematic” technique in New Treasure Island as a template as early as 1946. 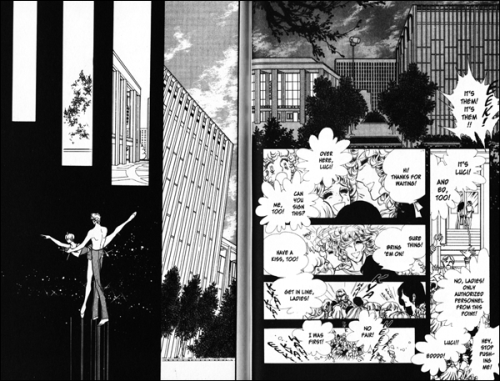 The negative connotations carried by the term “decompression” in US comics stems from a phenomenon which manga is by and large not subject to at all: the need for the collected volumes to comprise a STANDALONE story with a beginning, middle, and end such that a collected volume is almost always six chapters in length. Many stories as a result that would have been perfectly serviceable being told in the time span of fewer than six chapters are thus padded out or “decompressed” to make them be told in the span of six chapters, which on a monthly release schedule is half a year. The pacing is thrown off. I love manga. Especially old school seinen and stuff like Genshiken. Love it to pieces. The problem with regard to North American comics is that even Genshiken which came out monthly was buffered by other stories sold in the same magazine package. Then the solo collection would have full Genshiken graphic novel goodness. So if you were in Japan at the time of its serialization, you always got your money’s worth, no matter what. North American mainstream comics, that never happened. Instead, you have a 22-page issue that just has Avengers characters doing reality-TV style interviews with a handful of flashbacks to a random fight scene. That really happens and it costs a customer $3.99. That’s four dollars just to look at portraits of Hawkeye and Ms. Marvel talk at you. In the olden days, the 1980s on back, readers would be happy to have one page or two devoted to “breather” moments like that. But in order to make use of the space, time and money, the comic magazine told faster-paced, activity-based stories. Mostly, this is an issue of economics, when you get down to it. Your point actually reminded me of the fact that it wasn’t so unusual in older comics to package a lesser-known hero’s story with a more establish one’s. This makes me wonder about seeing more of that. The price point being such a killer is also a good point, and it’s one that multiple people have brought up. It can feel wasteful to just read so little after paying so much and waiting an entire month, the thought I wanted to express in part with this post is to not blame the concept of “decompression” so much as its execution in these instances, perhaps. Another major reason that American comic readers don’t like decompression is because they felt that they weren’t getting the biggest bang for their buck. The largest offenders were mini-arcs that would stretch out a story that could’ve otherwise been told in one issue. A lot of this can be attributed to not being exposed to GOOD decompression, where you’re getting a sense of rising anxiety or tension by turning the pages and wanting to see what happens next. For most American writers, this was a field that they were completely out of their element after being told to “draw out the story as long as possible”. As a result, this meant that you had five issues of build-up, and only ONE issue of action, whereas in Manga, you’d have maybe three chapters of build-up, and FIVE chapters of action. It’s the economy of scale, of making every page count for something, and the industry still has yet to figure out how to make this kind of compression / decompression work in a way that conveys the maximum amount of information within a certain set frame. Regarding that silent American comic panel, there’s a phrase that Goseki Kojima (Lone Wolf & Cub) used; “Good art is to sufuse feeling in even a single blade of grass”. That’s partly why the page doesn’t really work – there’s no real sense of connection there. Not to mention there’s no comprehension of the scene taking place. Is it a veiled threat? A casual day in the life of a worker? Without context upon first sight, we wouldn’t know for sure. That comics page isn’t strictly American, it’s from Ocean, the writer is English, Warren Ellis. It’s also a cinematic piece of old-school hard sci-fi, so world building is important. Thankfully in comics we can get thousands of words worth of setup presented in a scannable form that the reader can examine at-will or ignore, as opposed to text sci-fi where it must be read in order. There’s actually a great sequence right after this as this guy is riding into orbit on a sort of space elevator without a cable, where he geeks out about the history of spaceflight to the frequent-flyer in the next seat, who is quite clearly just wants to read his paper, but instead he gets to be a techsposition sounding board. It’s funny you should mention that, as I’ve been thinking a lot about the transition from purely text science fiction with all of its rich descriptions to an image-based medium like comics and how much is left for the eye to just interpret while things happen in the forefront. Admittedly I haven’t ever read Ocean, but maybe I should. I feel like the north American comic scene is a little more bipolar when it comes to this issue than you present here. There is a whole slew of American comics that use these pacing tactics and have been praised by peers and readers as some of the best comics has to offer: The Watchmen, Blankets, Black Hole, etc. American “comics” are not just the monthlies released by Superhero producers. We have a wealth of long form stories, webcomics, OEM and graphic novels that break those molds, and I would argue that in aggregate they have a larger audience than all superhero comics. It’s never just superheros vs. Manga, or I wouldn’t be into comics at all. Oh I agree, which is why I repeatedly expressed the contrast with specifically superhero comics. This post was an explanation for people who seemed to be adamantly against the very concept of it, an attempt to address their misconceptions. If you already understand that, then the most this post can potentially do is perhaps give concrete words to something you may have felt but not been able to express. There are even superhero comics which break the mold, which is why people are complaining in the first place. At the same time, I think it’s important to take into account some of the roots of American comics creation, which superhero comics comes out of. “Compression” as it were, is part of that history, and it’s something that still influences comics, even if that influence is to try and not have it at all. Though I might not consider Watchmen to be “decompressed,” but I’ll save that for another post. The problem is the filler. A story that has a solid beginning, middle and , end, for the sake of argument, can be told in 3 issues. That’s all the story we have. Due to corporate greed, I think writers have been told to stretch it for the tpb, and now you have double the pages, but still a 3 issue tale. Genshiken seems like a bad comparison. It seems to be about people, conversations, and life as usual. Superhero comics are about the fantastic feats, and larger than life heroics of the protagonists. You’re comparing apples and oranges as far as decompression goes. Like comparing the Expendables to Magnolia. Go ahead and add an hour of conversation to the Expendables and see how that plays. I can guarantee it won’t be as popular.